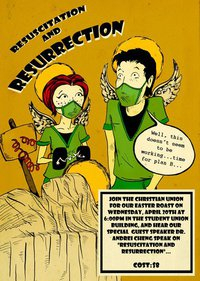 This Easter season we are celebrating by having a spit roast dinner and with a medical doctor as guest speaker looking at the resurrection as compared to resuscitation. It’s on this Wednesday at 6pm in the SU. Cost is $8 for dinner but you should be able to convince a CU regular to shout you. RSVP and invite others on Facebook if you like. Happy Easter from Bendigo CU!